News of LiU’s Återbruket is spreading through Swedish academia. There are many people who want to know how we work to reuse furniture and office equipment. Uppsala University came for a study visit in the week before Christmas. It started as a project supported by the LiU fund for carbon offsetting. An extremely thorough investigation led to a policy being drawn up that made it possible for Micke Nilsson to start building up the internal service Återbruket. This opened officially on 21 April 2016, with a service in Lisam for buying and selling. With the simple and obvious watchword “Choose Återbruket first” when purchasing furniture, the service has become a huge success, and rumours of its success have spread to Uppsala University. 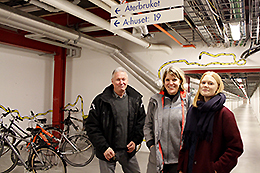 In the week before Christmas, Karolina Kjellberg and Johanna Hillforth from the Unit for Environment and Physical Work Environment came to LiU on a study visit. 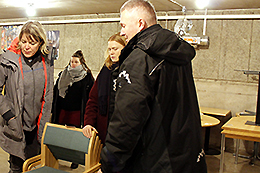 It was when 600 employees in University Services were to move without taking any furniture with them, that Uppsala University started a small reuse project. Just as at LiU, some of the departments at Uppsala University have restricted budgets, and thus there is a great deal of interest in second-hand items. The situation for Uppsala University is, however, rather different. The university has 7,000 employees and operations are spread across nine locations in central Uppsala and Gotland.